Campylobacter is an infectious bacterium that commonly causes illness. Symptoms of campylobacteriosis include diarrhea, abdominal pain, cramping, and fever within two to five days of exposure. Most of the time, the illness lasts a week, but in some cases it can cause more serious long-term complications, particularly in those with compromised immune systems. Our camplyobacter lawyers know that it usually occurs in a single case rather than an outbreak, but outbreaks can occur in connection with contaminated water, poultry, or unpasteurized dairy products. If you have been harmed by a campylobacter infection in contaminated food, you should contact a product liability lawyer to discuss your options. At Moll Law Group, we have represented consumers nationwide for these types of claims and billions of dollars have been recovered in cases in which we were involved. It takes just a few campylobacter organisms to make someone sick. One way that people become infected is by cutting raw meat on a cutting board and then failing to wash the board before using it for raw foods like vegetables. Some individuals may suffer long-term complications, such as Guillain-Barré syndrome or arthritis. The former occurs when someone's immune system is triggered by the infection to attack its own nerves. The resulting paralysis can last weeks and require substantial care. A food contaminated with a foodborne pathogen is defective, and damages may be recovered by a campylobacter lawyer if a consumer is harmed as a result of consuming the food. In most states, food is a "product" for purposes of product liability law, and the presence of a pathogen renders the food defective. 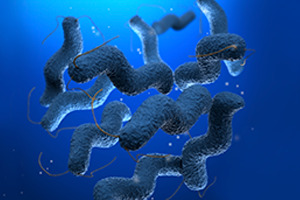 Plaintiffs seeking damages after exposure to campylobacter will need to prove that the defendant produced or sold the contaminated food, the defendant caused the contamination or failed to take care to prevent it, the plaintiff consumed the contaminated food, the plaintiff suffered an illness as a result, and the plaintiff was diagnosed with food poisoning based on the contamination. Since campylobacter may not develop right away but may take a few days to manifest, the causation element may be complicated to prove. Proving causation starts with having a stool sample tested for pathogens before antibiotics are used. After the diagnosis, further tests will need to be done through pulsed-field gel electrophoresis. A key aspect of a case is finding evidence that implicates a particular manufacturer, food processor, restaurant, or food. Submitting this proof is easier if there is an outbreak among numerous people, all of whom ate the same food containing the pathogen. In some cases, it may be possible to build a case when multiple people eating at the same restaurant got sick, even if they did not all eat the same thing. Most food poisoning cases pass relatively quickly and do little harm. However, if you suffered substantially and incurred medical bills or other expenses due to an infection caused by campylobacter, our product liability attorneys are available to help you recover compensation for your injuries. Moll Law Group represents injured consumers in many states around the nation, such as California, Florida, New York, Pennsylvania, Ohio, Texas, and Michigan. Call us at 312-462-1700 or use our online form to schedule a free consultation with a campylobacter attorney.